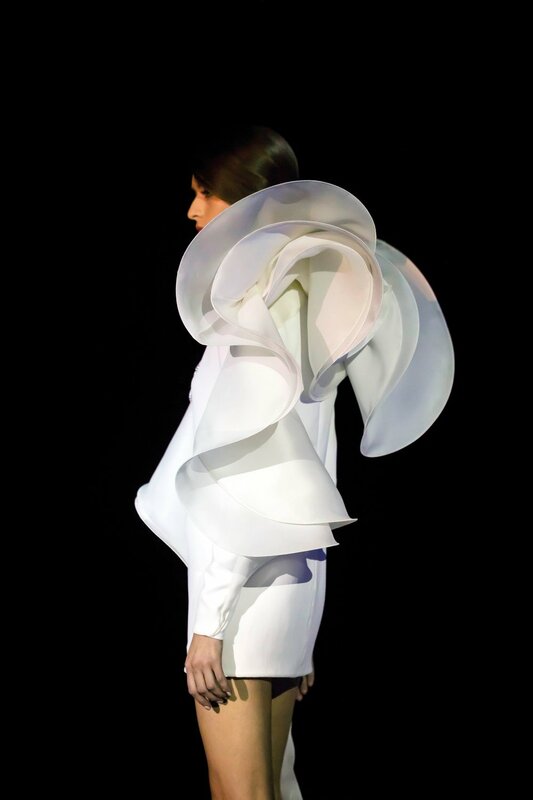 Stephane Rolland’s creations have often been influenced by architecture or kinetic sculptures, with the designer preferring to focus on forms and shapes as embellishments rather than details such as embroideries. His Spring 2018 Couture collection, presented in the Favart room of the Opera Comique, was a continuation of his refined style, in a softer and lighter allure to emphasize a more nonchalant attitude. The opening look, a black wool tuxedo sported a white gazar calla lily wing “sculpture” on one shoulder, a shape that returned throughout the collection whether on a “simple” tee shirt in crepe mousse paired with slim pants or a long coast in platinum lamé cotton. A giant black taffeta blouse created the effect of a ballooning cape as the model walked and contrasted beautifully with her slim pants in coal lamé cotton. Appealing to a young clientele, the designer created "crinoline-tee shirt” on white leather shorts as well as a short sweater dress with a giant sculptural lapel. Embellishments included metallic mosaics that had a slight 1960s feel, and six gowns were embroidered with precious stones (including diamonds) in a creative partnership with the jeweler Albert Boghossian.